I've talked about Mighty Bright book lights here in the past and I'm excited to talk about a new product that they've added to their line of lights - The Miniature LED Task Light. When asked if I'd like to review the light I jumped at the chance because I love Mighty Bright Products! They are my go-to company when I need a book light. They last forever, are extremely functional and even easier to use!! 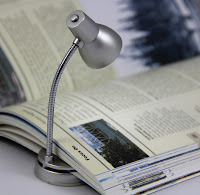 The Miniature LED Task Light is beyond cute and reminds me of retro desk lamps. The light I received is pink, with a flexible neck, push button on and off switch. The brightness of the light illumination is pretty incredible It really lights up a pretty large area with ease, which surprised me a bit. The thing that's different about this light is that it doesn't have a clip to attach the light easily to a book or papers, etc. This is the one thing that I think that let me down. If I could change anything it would be to add a clip so that I could use it more as a book light than a miniature desk lamp. If you are looking for the perfect light, Mighty Bright has the perfect one for any and all readers. They have never let me down in the past or the present and I look forward to reading more books via their lights well on into the future. Mighty Bright’s Tiny Task LED Light has a fun frame, but it also provides functional light. Move and point the Tiny Task’s flexible neck and rotate and pivot the shade to target the light. The light’s single LED pushes out bright white light to illuminate any task at hand. It’s perfect for low-light reading, traveling, or as your new sidekick: tuck the Tiny Task in your purse, your backpack — even your pocket — for energy-efficient light at a moment’s notice. Mighty Bright wants everyone to have light — wherever and whenever they need it. Based in Santa Barbara, CA, Mighty Bright designs and manufactures portable LED lights and LED task lights for home and office. Our lines of eco-friendly LED lights make lives easier — whether they are used for reading, performing a favorite tune, crafting, or even camping. Mighty Bright lights blend ease of use and affordability with impressive functionality, durability and portability. No matter your illumination needs, Mighty Bright is there to fill them. Contact Mighty Bright at www.mightybright.com.